Matthew 5:24 …leave your gift there before the altar and go; first be reconciled to your brother or sister, and then come and offer your gift. During the nineteenth century when Claude Monet, Auguste Renoir, and other artists in France went to the Fontainebleau Forest to paint in the open air (plein air painting), they discovered that sunlight causes subtle and constant changes in the colors we see. They observed that changes in the atmosphere and seasons affected colors as well. Further, they realized there was not a right and wrong color for the trees, sky, or water. “Reality” was a passing moment and they tried to record the colors as they appeared. Upon a return to Paris, other painters joined them in exploring the effects of light and they held an exhibition together in 1874. When the critic Louis Vauxcelles saw the title of a Monet painting, “Impression, Sunrise,” he clung to the word “Impression” and declared derogatorily that the artists were “Impressionists.” He did not understand what the artists were attempting and neither did the public. “Impressionism” became accepted as the style’s name but even today misconceptions continue. Many believe an impressionist painting is an artist’s obscure impression of a subject. It is not. 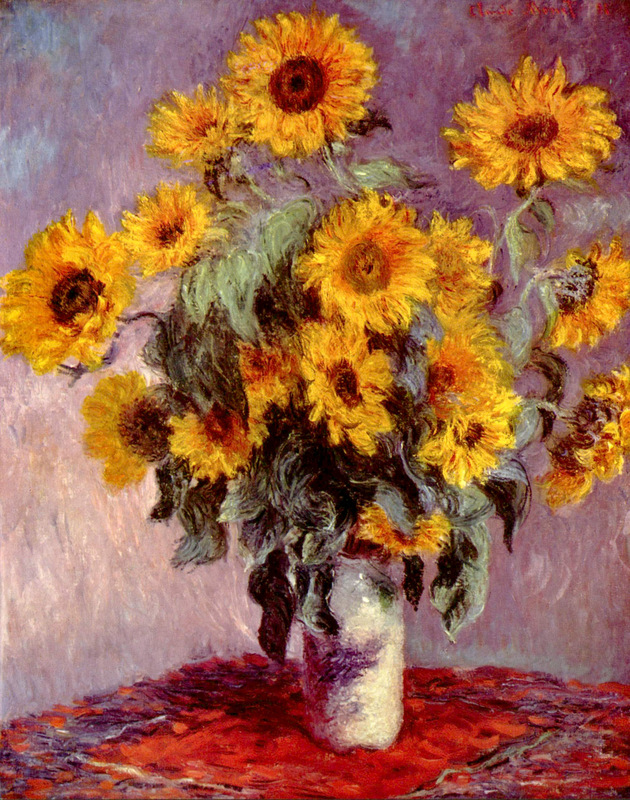 “Sunflowers,” shown here, was at the Impressionists’ exhibition of 1882. Of particular note is how Monet painted the area around the flowers. It is treated as an integral part of the painting, not a leftover to be filled in after the flowers were completed. Instead of regarding the “air” around the flowers to be “negative space,” Monet unified the painting’s surface with brushstrokes and colors that are interacting visually with the sunflowers. Sunflowers are native to North America and were cultivated for food by Native Americans. Spanish explorers introduced them to Europe and by the 1830s its oil was being processed for commercial use. It was the Russian Orthodox Church, however, that set into motion the large industry of sunflower oil production we have today. The Church listed foods that were to be avoided during Lent; included were butter and lard. Sunflower seed oil was new, overlooked by the Church, and failed to be listed. Its widespread use during Lent helped make it enormously popular and in great demand. Its sun-like shape and color gave the sunflower its name and its almost universal positive associations have made it a favorite subject of painters and designers. Today, sunflower motifs are seen regularly in designs that enrich our homes and when they are presented as gifts they become an unspoken sign of warmth, love, and appreciation. Oh, Hovak! Such a happy post. Thank you. Sunflowers “sun-like shape” do bring such happiness…as do you. Great lesson. Important blog. Thankful me. Stan, kudos to you, too. I will order The Possibilities of Forgiveness from Amazon this week.